I'm still blogging away. I wanted to join some more parties this week. I had this post planned for another day but I'm working about 15 hours this week. Sweetheart and I are going to be at a friends this Sunday for Superbowl. I put my new Pink Willow dishes in the cabinet where we have our kitchen television. I change the cabinet about 4 times a year. But I like this display the best. When I get some time I'm going to clean and arrange all my dishes. Since I have been blogging I have accumulated more dishes and etc... I want a system where everything I use for a Tablescape or a Tea party is in the same place. I love the shape of this casserole dish. I was thinking this summer I would use it as a vase. You might see it again real soon. Some of the beautiful pink roses would be nice. The soup tureen is vintage. I have used it on Christmas Eve to serve soup. Playing with my camera. Glass is a tricky thing to photograph. I have mixed some white with my pink dishes. The white tea pots were used at my Christmas Tea and the white cup and saucer is Johnson Bros and my granddaughter spotted them while we were thrift shopping this summer. Thanks Beth! These dishes are going to be all over the place this summer. Tea outside under the pergola would be nice. Tea in the patio would be nice. Tea in the living room would be nice. Tea in the dinning room would be nice too. Oh Betty, I LOVE your china! I have some of those Pink Willow pieces too. They look stunning all displayed on your shelevs; very charming. Thanks for giving me a peek at your pinks. Yes, you are right. Your dishes are just right for tea anywhere! I am afraid it may be impossible to keep all of your tablescape stuff in one place. When inspiration can come from anywhere, you end up using stuff from everywhere. Beautiful transferware. Perfect for anytime of year! Perfect in your cozy corner ! Wish I could get organized and have all things that go together...together. First of all I love your header, it's perfect for the season, you are so computer savvy, I admire that so much! I'm not too good at blog computer creations, lol. 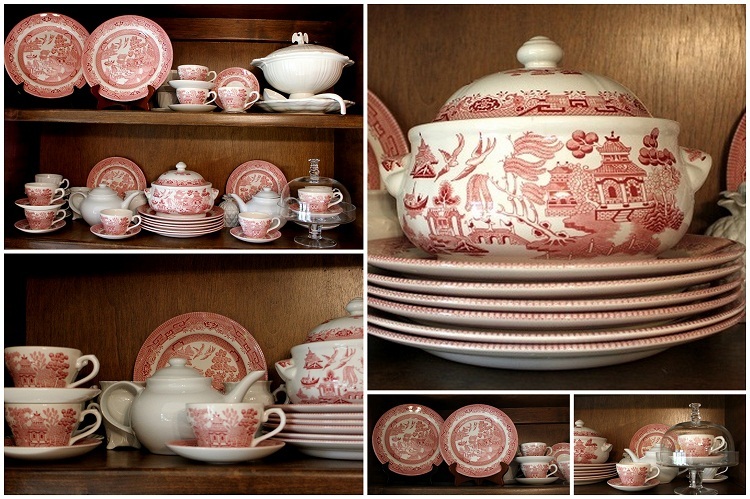 Your pink transferware is gorgeous, my very fav color! I love the way you've displayed your lovely hutch. Thank you for coming and for the sweet and lovely coment on my Valentine's table. Happy weekend to you. Love love love your red transferware. I have a collection of it too. Absolutely beautiful. Thank you for sharing it with us this Pink Saturday. Following on Linky, hope you come follow too. What a gorgeous set of pink (blue) willow dishes...they are wonderful!! The tureen especially must be a hard to find item!